I think this weekend has to have been one of the worst for fishing for a long time. It is pretty normal for the fishing to switch off during January and February. We have been pretty lucky this year that it has lasted so long. I think the best we can do now is spend some time maintaining our tackle and tying up some new rigs for the Plaice run that may come early again this year. There were very few decent fish caught over the weekend, with one strap Conger and a small Codling being landed by the guys fishing the Samalite league down at Checkpoint. Dogfish were present in large numbers at the Western end of the beach. One of the reasons I like to target as many species as I can during the year, is that it fills the slow months trying to catch fish that are normally only around when it is cold and bleak. Species such as Rockling and Coalfish are a couple that you are more likely to catch at the moment than at other times of the year. It is also the time that I get out my LRF gear and target the mini species. So for those of you that are interested I will concentrate on some LRF techniques and tackle tips this week. but for the moment I will provide you a picture of the most exciting thing to happen this weekend, a decent Chesil sunset, the picture is courtesy of Leo from Poole. Just in case you miss it, I have put up a post about my trip to River Cottage on Friday. You will find it below this post. All I am going to say is that it was a fantastic day out. Chesil Beach: A heavy swell and long surf run off, the water is coloured. Weymouth Bay: Wavelets but the water has a bit of colour especially around the harbour entrance. 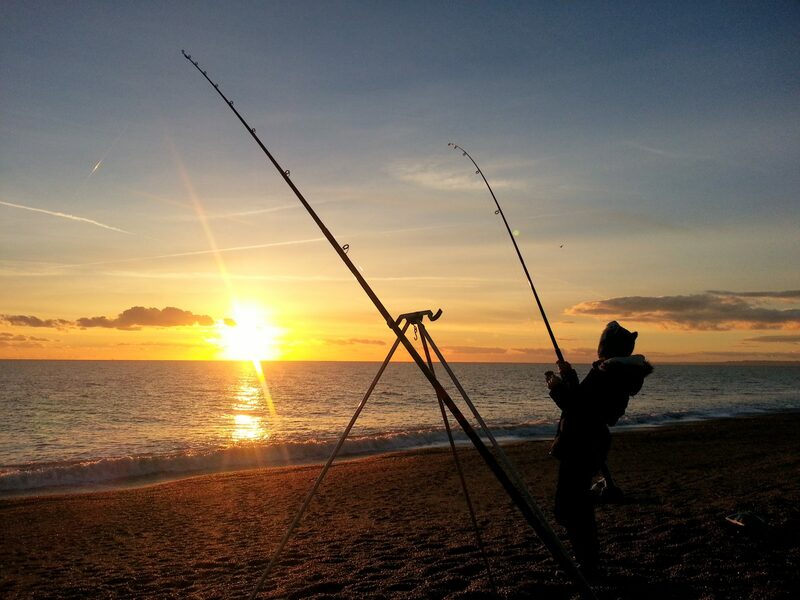 Chesil Beach forecast: Not the most comfortable conditions for fishing Chesil Beach and after the reports from the weekend, I am not sure I would bother fishing it. If you do decide to give it a go then the most likely species you will encounter are Dogfish, Dabs and Rockling. Portland: The water has cleared slightly which will suite the Wrasse that are still around. Portland is a good mark for several of the Rockling species that I will be targeting in the next couple of weeks. East side marks will still be good for Bull Huss and Pollock.